Welcome to my blog! I am listing 10 lots in Beautiful Bella Vista, Arkansas - these are prime building lots (my client hand picked these lots out of hundreds of lots...) - we are offering each lot at $12,000 OR purchase ALL 10 for $100K. My seller would also consider building a custom home for you on one of the lots, too if you would prefer to go that route. Call me for more details on each individual lot or check back for more information. Bella Vista has 7 golf courses, 7 lakes, Community Clubhouses, Swimming, Tennis, Walking Trails, and beautiful rolling hills and landscaping & SOME BEAUTIFUL HOMES AND LOTS FOR SALE!!! 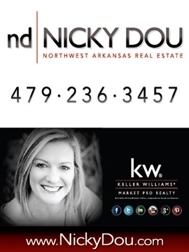 CLICK HERE TO SEARCH ALL REAL ESTATE FOR SALE IN NORTHWEST ARKANSAS - THE BEST MLS SEARCH IN ALL OF NWA!!! !